In my last post, I discussed Harvard’s findings that less sleep could be linked to obesity, so we know at least one reason you and your baby should get enough sleep. Let’s explore other reasons as stated by Harvard Health. Have you ever tried to learn something new when you are tired? It’s hard! Well, the old saying goes that “we learn something new every day”. Babies and toddlers are learning new things probably every minute (I might be exaggerating…I didn’t look it up but I know it’s a LOT!). I notice that as the day wanes on, now that my toddler isn’t napping anymore, it is much harder for him to concentrate and learn new things or even do things he already knows how to do like a jigsaw puzzle he has done many times over. I also notice he gets clumsier. Fortunately, overall, he gets enough sleep and is better able to learn and is actually very smart (yes I am partial, but other people tell me too, I swear!). I am sure everyone has experienced moments during the day when you practically fall asleep mid-stride. If you are driving a car, operating on someone, or bringing an airplane in for a landing, this could lead to dire consequences if you haven’t gotten enough sleep or are chronically sleep-deprived/fatigued. I remember one mom I helped who said she had run two stop signs (with her baby in the car) because her baby just would not sleep and she (and the baby) were severely overtired. She knew she had to make some changes if only for their safety! One reason I don’t make my husband get up at night with the babies (besides the fact I nurse and there isn’t too much he can do anyway) is that if one of us is getting enough sleep, that person (hubby) is better able to “handle” the one who is sleep-deprived and moody (me). My toddler’s behavior and crankiness level change A LOT when he isn’t getting enough sleep. We have many more meltdowns and tantrums. You are more prone to illness when you don’t get enough sleep. Your immune system is not functioning at the highest ability. This goes for your baby and toddler too and who wants to get up all night with a sick child? Obviously we won’t be able to ward off all illnesses, but even a few puts a little more sanity back in your favor. , has slightly lower averages, but fairly comparable. 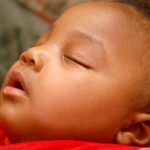 All babies are different and these are just averages, but you can see that babies and children do need a lot of sleep. Adults need 7-8 hours each night. I can’t remember the last time I was able to get 8 for more than one night in a row! Oh yes I can. It was before I had kids. How much sleep does your family get?